Tuesday, Sep. 18, 2018, 6 – 8 p.m.
Fighting Hate and Stereotypes through Cartoons with Vishavjit Singh aka Sikh Captain America. 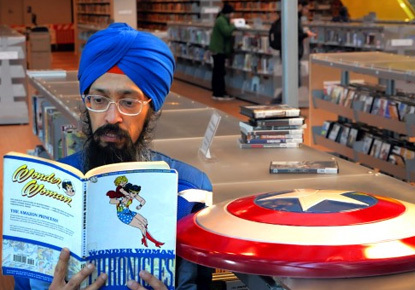 Vishavjit Singh aka Sikh Captain America is a cartoonist, speaker, performance artist and creator of Sikhtoons.com. Vishavjit Singh is visiting from New York to share a few stories armed with cartoons and photographs. There are wild twists and turns, turbans and beards, love and despair, war and peace, Captain America and cool shoes. Singh’s work is currently featured in an exhibit, “Wham! Bam! Pow! Cartoons, Turbans and Confronting Hate” at the Wing Luke Museum of the Asian Pacific American Experience in Seattle which runs through February 2019. Singh is also a Creative Arts & Diversity Fellow at the Washington based advocacy group, SALDEF.